Please note that meetings with a Last Chance Race are going by the assumption that the Top 20 drivers all compete in the meeting. The standard rule of "reserves replacing absent drivers" will apply otherwise. A Last Chance Race will not be run if there are insufficient numbers of non-qualified drivers (less than 3); in this case, the drivers would be added to the back of the grid in race number order. At the start of the season, I conducted a draw to decide the grid for the CoC race. The full grid will be kept secret until the final place is filled, but the below grid will be updated as the season progresses, so drivers don't try and aim to qualify via a certain method and get a better grid position. The only position that has been revealed as of the start of the season is the previously mentioned fixed position of the CoC Last Chance Race winner, who will start on the outside of the eighth row. As all spaces have now been revealed, the last remaining qualifier of the European Championship has been included in the grid. All applicable spaces on the grid have now been filled. 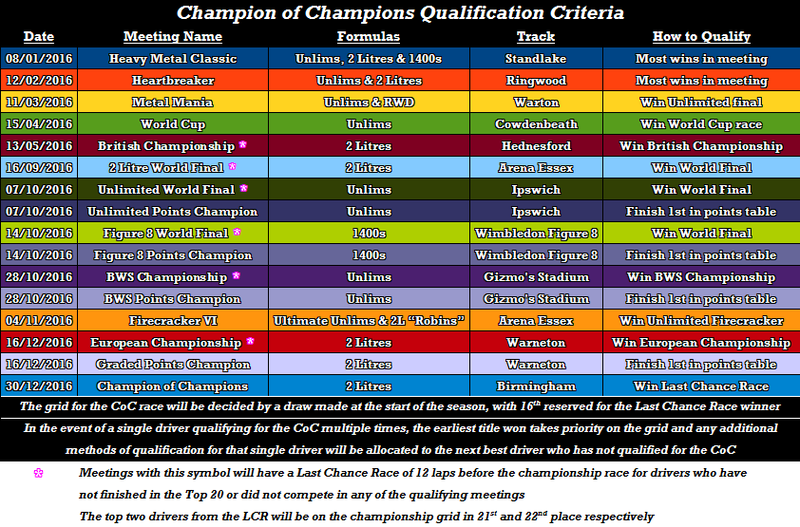 The sixteenth and final place on the grid will be decided in the Champion of Champions Last Chance Qualifier that will be held before the main race. In the event of any absentees of the automatically qualified drivers, they will be replaced with additional places awarded from the LCQ. All drivers behind the absentees will be moved up to fill their positions.